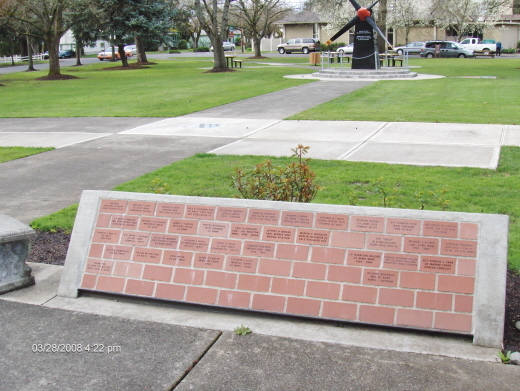 This unique monument is to commemorate all veterans of all services in all the wars, conflicts and peacekeeping missions since 1893 when Beaverton Oregon first became a city. The monument is located in the City of Beaverton at the Veterans Memorial Park, corner of 7th Street and Watson Streets. Each brick is 3 1/2" x 7 1/2" providing an opportunity for three lines of 17 characters per line. Each space, letter, number or punctuation mark is a character. The computer will center each line. Donation of $75.00 per brick. That pays for its manufacture, prepetual care of the Memorial, lights, security and landscaping. Please click here to display the brick request and print.